Though he has a friendly and welcoming attitude, seeing him being the owner of both nithya vibhUthi (spiritual realm which exists for his true pleasure) and leelA vibhUthi (material realm which exists for his sport), would we able to approach him? Though he has a friendly and welcoming attitude, seeing his greatness of being the owner of the unlimited ubhaya vibhUthi (material and spiritual realm), for some one like us, it will be difficult to approach him. So, if we say that we cannot approach him, then nammAzhwAr says “if we understand our eternal relationship with him, we can console ourselves and approach him without any worries”. Subsequently, instead of shying away from him seeing his wealth (of ubhaya vibhUthi), nammAzhwAr says that one should meditate on the relationship between emperumAn and his ubhaya vibhUthi and one should understand that oneself is among the property of emperumAn. Previously nammAzhwAr said emperumAn has a friendly attitude towards everyone. Though he is friendly, he is still the owner of unlimited and great realms (material realm and spiritual realm). The one who is approaching him is too simple and have very inferior senses, etc. With this, how can emperumAn be approached? When a boat is being tossed around in the ocean, would it not naturally be pushed to the shore? Similarly, emperumAn’s greatness will push the jIvAthmA to the ultimate goal. But, what if the jIvAthmA resists seeing his disqualification and emperumAn‘s purity? At that time, the jIvAthmA needs to meditate on the relationship between emperumAn and himself and realize that he is also a part of emperumAn‘s wealth – this sambandha gyAnam (understanding the relationship between oneself and bhagavAn) is all that is required to approach him. A merchant travels to a distant land while his wife was pregnant to earn money. She gives birth to a child and he grows up as years pass by. Following the family tradition, the grown-up boy too travels to the same location and camps where his father is doing business. They dont know their father-son relationship yet. A dispute arises between them where they setup their shop and that leads to physical fight. At that time, another person who knows both of them arrives there and highlights their relationship. At once they give up their fight and feels sorry for the days that were lost in-between. The son submits all his wealth to the father and abides by his father’s desire. 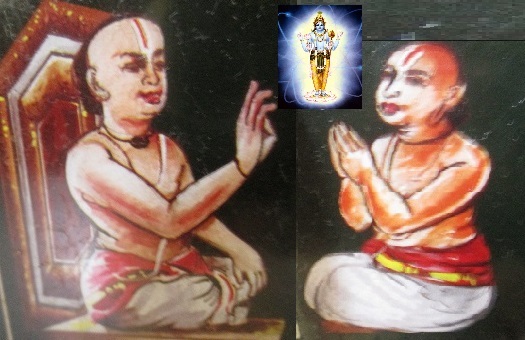 As explained in rg vEdham “dhvA suparNA … samAnam vruksham parishasvajAthE” (two birds exist in the same tree…), both jIvAthmA and paramAthmA exist in the body – while one (jIvAthmA) enjoys the fruits of their action, the other one (paramAthmA) remains shining overseeing the activities of the first one. Once we realize that he is the controller and we are the controlled, we can easily approach him. A prince comes across a beautiful garden and hesitates to enter. At that time, if some one says “This is your father’s property. Feel free to enter and enjoy yourself”, the prince will happily enter the garden. Similarly, one should understand everything is under the control of emperumAn – then oneself can also become part of that. adanguga – become a part of it. Meditating upon the fully beautiful wealth (which includes everything without leaving out even a single entity), knowing that everything is beautifully subservient to him and thus knowing the relationship, become part of that wealth. Once the true relationship (between oneself and emperumAn) is understood, then one can become part of his wealth/property. AzhwAr says – Meditating on ones relationship with emperumAn, knowing that “everything is owned by my master”, approach him and serve him without any shy or hesitation. Similar to nampiLLai‘s vyAkyAnam. periyavAchchAn piLLai indicates that bhattar narrates the story of the father and son meeting at a distant place to explain this pAsuram’s meaning. adangu ezhil sampaththu adangak kaNdu – nithya vibhUthi is bhOga bhUmi (place of enjoyment). This (leelA) vibhUthi is bound by karmA under his control. While nithya vibhUthi can be explained as beautiful, why is leelA vibhUthi too explained as beautiful? Considering it as his property and creation, it can also be said to be beautiful and the fact that it is bound by karmA will not be seen important at that stage when we see everything is emperumAn‘s property. adangu ezhil … – Having seen all the beautiful wealth, meditating that this is the wealth of our apt/true master and then one can consider oneself as part of that wealth as well. By doing so, one can bring joy to ones master. “sEsha bhUthanudaiya svarUpa sidhdhi sEshipakkal kinchithkAraththAlEyAy irukkumE” (The true nature of a servitor will be established only by performing (atleast) some small kainkaryams for the master). adanguga uLLE – Based on having knowledge about sva-svAmi bhAvam (property – owner relationship), one can also engage as a part of emperumAn‘s wealth. Though ocean is great/huge, the aquatics which lives inside it can freely swim in it. Similarly, by knowing our relationship with emperumAn, he can be easily approached. A grass which does not relate to the ocean is pushed out by the waves to the shore. gataka kruthyam (the role of AchArya) is to make one realize their relationship with bhagavAn. This entry was posted in thiruvAimozhi, thiruvAimozhi 1st centum on May 19, 2015 by Sarathy Thothathri.